Home » What’s the Best Air Compressor For Nail Gun? What’s the Best Air Compressor For Nail Gun? You just bought a framing nail gun or a finish nail gun to complete your home project, but you don’t know “what kind of a compressor + how many CFM at what PSI” do you need to ensure those tools will work properly, then our buying guide will help you make the right decision. Before we look at the best air compressor for nail guns, it’s important to point out there are a few different type of nail gun available. Each requires a different air volume (CFM) and air pressure (PSI) to drive nails. All of the compressors we tested deliver enough PSI for any type of your nail gun (typically under 120 PSI). But some models with a higher max PSI can keep up with repeated nailing in a longer time frame. And only the ones with ratings of about 2 CFM or higher will keep up with a framing nailer when you’re working at moderate speed. Those with lower PSI and CFM ratings will require patience, you’ll drive a few nails, then wait for the compressor to catch up. We choose the best compressors that have storage tanks ranging from 1 to 8 gallons. They are the most common sizes of air compressors to power nail guns. In almost all cases though, they are built with portability in mind, lightweight and compact design so you can always move it from site to site without any trouble. You don’t have to buy the one that has a bigger tank, but a bigger tank does have one real benefit: It allows you to use more air before the pressure drops and the motor kicks on to refill the tank. That might let you avoid stopping work while the compressor refills the tank. You’ll find some tips on where to start and what to look out for to choose the right air compressor for your air tools. But if you already know what you’re after, then check out our top pick below. 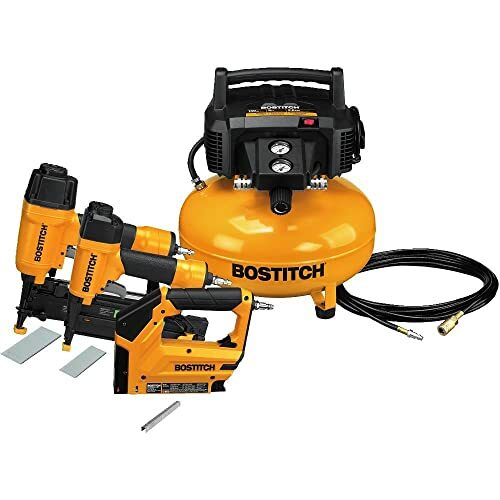 One of the best all-round air compressors for nail guns is the BOSTITCH BTFP3KIT 3-Tool and Compressor Combo Kit. It topped our scores for convenient use, noise level, compact design, and recovery. It was also among the best for a low price, which is the biggest draw for most shoppers. Bear in mind that this is a combo kit, which contains a 6-gallon compressor, finish nailer, brad nailer and stapler. Beware choosing the cheapest deal you can find online before checking what comes in the box. More and more people are choosing to buy a combo kit rather than only a compressor, and for good reason. You only need to buy once, then you have everything to get the jobs done. And buying a compressor combo kit is also a great way to save money. The problem is that the combo kits may include stuff that you don’t want or need. PSI is the measurement of air pressure and force that is delivered by an air compressor. Higher numbers mean that a larger volume of air can be compressed in the tank. When selecting the best air compressor for your nail guns, you don’t need to pay much attention to the PSI rating. Most compressors provide plenty of pressure for tools and tasks. In that sense, the PSI isn’t much of an issue. Note: When using nail guns, don’t miss the PSI rating. Because nail guns are intermittent tools, they require specific PSI to properly function. CFM tells you how fast the small air compressor can supply air. And it’s usually the most important number to consider. If a tool uses air faster than the compressor can supply it, you’ll have to stop working and wait for the compressor to catch up. When selecting an air compressor you need to identify the CFM requirements of your nail guns. If you will only be using one tool at a time, use the tool with the highest CFM requirement. If you intend to run multiple tools at the same time you will need to total the CFM’s required by each tool. The best results are obtained when you purchase a compressor with 1.5 times more CFM airflow at the recommended PSI than your nail guns require. This method will ensure the performance of your nail guns will be maintained without overworking the compressor and losing efficiency. For example, if a brad nailer requires 0.3 CFM at 90 PSI, select a compressor that delivers at least 0.45 CFM at 90 PSI. If you plan to use 2 brad nailers simultaneously, then the compressor should deliver 0.9 CFM at 90 PSI or higher. How large of a tank do you need? Air compressor tank sizes are measured in gallons. Nail guns are intermittent tools, they don’t require an air compressor that has a large air tank. You can use a 1-gallon compressor or a 20-gallon to run your tools. However, BIGGER is BETTER. Once the tank is filled with compressed-air, a larger tank compressor will not have to run as much to maintain the CFM’s provided the compressor pump can produce more CFM’s than you are using. If you are planning to use your nail guns that will require continuous compressed air, then you should consider a larger tank. Let’s start with the heaviest duty nailer – the framing nailer or framing nail gun. As the name suggests, this type of nail gun is used for wood framing in a building and heavy construction. What size air compressor for framing nailers? Framing nail guns require the most air pressure because they typically use 2-inch to 3 ½-inch nails that are driven into framing studs during the construction process of rough framing. Typical air pressures for this application range between 100 psi (pounds per square inch) and 130 psi. When choosing the best air compressor for framing nailers, you should look at the models that have 120 max PSI or higher. The framing nail guns use more air than other types of the nail gun. They require the compressors with ratings of about 2 CFM or higher to work properly. Almost any of the compressors on the market will serve that requirement. But as pointed out above, you will need an air compressor that rated at 4 CFM or higher if you want to use 2 framing nail guns at the same time – not many small air compressors meet that requirement. 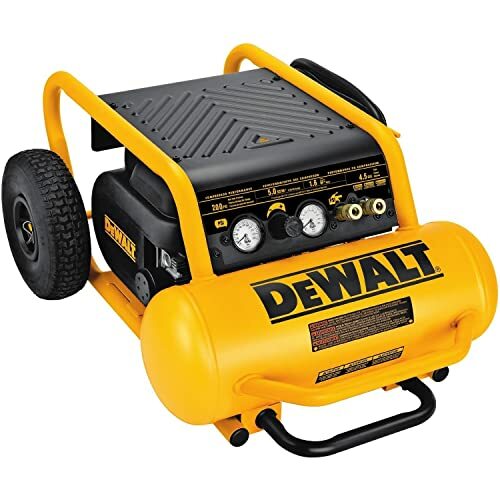 One of the best small air compressors for framing nailers is the DEWALT D55146 4-1/2-Gallon 200-PSI Hand Carry Compressor. It has a 4.5 gallons tank and produces up to 5 CFM at 90 PSI, 200 max PSI – allows you to simultaneously operate up to 2 framing nailers. It is also convenient, with an oil-free, maintenance free pump and is easy to move & store with pneumatic wheels. Brad nailers and finish nailers are both used in carpentry, drive nails into the surface of wood materials. Brad nailers, such as the BOSTITCH BTFP12233 Smart Point 18GA Brad Nailer, are designed to run 18 gauge brad nails. These small nails are very hard to drive manually, which makes a brad nailer essential to any major home renovation project where brads are needed. Finishing nailers, such as the NuMax SFN64 Straight Finish Nailer, will run 16 gauge finish nails, which are slightly larger than a brad nail, giving them increased holding strength. What size air compressor for finishing nailer and brad nailer? Most finishing nailers and brad nailers need around 60 to 100 PSI and 0.3 to 0.5 CFM, so that any little air compressor on the market will fire the nails. Each nail takes a certain volume of air, fire lots of nails in a short time period, that is more air required. If you use a pancake air compressor, you can drive 50-100 fasteners before having to recharge it. For those nail guns, we would suggest you buy a portable pancake air compressor that has a high CFM rating and low amp motor, such as the PowRyte Elite 4 Gallon Oil-Free Pancake Portable Air Compressor. This little one is ideal to support multiple trim finishing nailers, small framing/roofing jobs and all general inflation, blowing and smaller SCFM air tools. It has a 4-gallon tank and delivers 2.2 CFM at 90 PSI and 135 max PSI, which is enough to power all of your nail guns. Plus, it’s small, weighs only 22 pounds. Roofing nailers or roofing nail guns air called “coil nailers” because the nails that go into the gun come in coils and are inserted into a round housing. The nails go through the gun like a belt, preventing jamming while in use. Roofing nailers shoot 1 1/4-inch nails to 2 1/2-inch roofing nails made of galvanized steel to secure asphalt composite shingles to a roof. What size air compressor for roofing nailers? Burying the roofing nail too deep or not deep enough can affect the life of the roof, so it is very important to choose the right air compressor. Like framing nailers, roofing nailers use more air than other types of the nail gun. Most roofing nailers need around 70 to 110 PSI and 2 to 2.5 CFM. Some high-speed models, such as the PORTER-CABLE RN175B Roofing Nailer, need at least 4.1 SCFM at 90 PSI to run. But it does allow you to shoot up to 120 nails before reloading for maximum efficiency. The best air compressors for roofing nailers should have a CFM rating of 3 CFM at 90 PSI or higher. Two nailers used at the same time needs double the CFM. 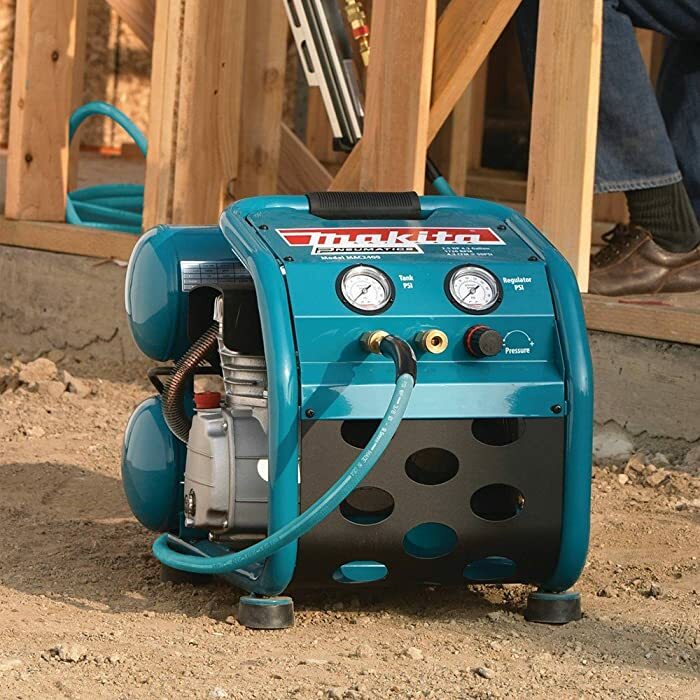 If you want to buy a portable air compressor that’ll power most roofing nailers and last for a couple of decades, look for a model with a cast iron cylinder, oil lubrication and air output of at least 4 CFM, like the Makita MAC2400 Big Bore 2.5 HP Air Compressor. This is one of the top-rated air compressors on the market. The Makita MAC2400 is equipped with Makita’s Big Bore engineered pump cylinder and piston for higher output, with less noise and improved job site performance. It has a 4.2-gallon twin-stacked tank sustains an operating pressure of 130 PSI, and delivers 40 PSI (4.8 CFM) and 90 PSI (4.2 CFM), enough for two typical roofing nailers. The roll bar handle provides portability and additional protection, helping it withstand harsh jobsite environments. If you want to install hardwood flooring in your home, then a floor nailer (or flooring nail gun) is a must-have tool. A flooring nailer allows you to make quick work of the tedious and tiring task of nailing down hardwood flooring, while also inserting the nail cleat at a perfect 45-degree angle. What size air compressor for floor nailer? 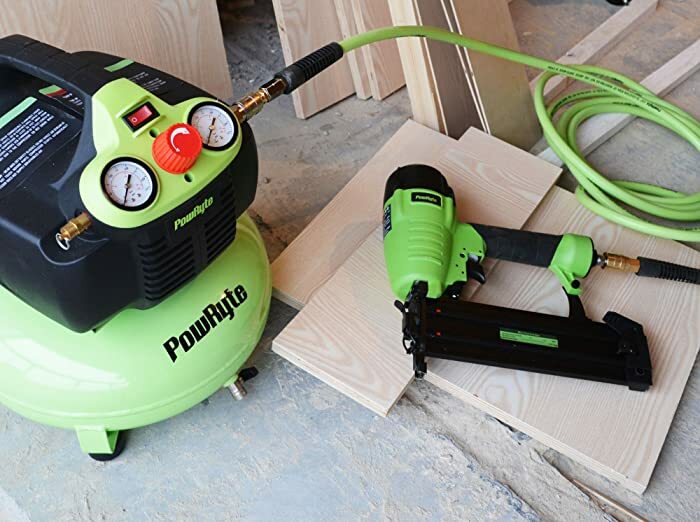 A typical pneumatic flooring nail gun uses a compressor to provide air at approximately 70-100 psi and 2 – 2.4 CFM as the power source to drive the cleats into a wood floor. If you are just going to build a few projects around the house and not in a big hurry then a compressor with CFM rating of 2-3 CFM at 90 PSI may be ok. But if you are going pro then don’t buy a model that rated under 4 CFM. You won’t go wrong with the Rolair FC2002 2-HP 4.3-Gallon Twin Stack Compressor. 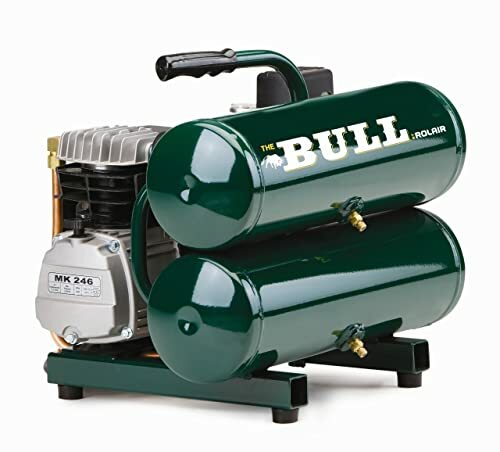 Rolair calls this model The Bull with good reason – it’s a portable compressor with a 100% duty cycle. It’s one of the best-selling hand-carry compressors on the market. The high-speed 2-HP pump/motor puts out 4.1 CFM @ 90 psi- plenty of air to run any gun you need. The compact tank design makes this compressor easy to move to and from the jobsite and won’t take up much storage space. Plus, it is equipped with a cold weather start valve. This allows the compressor to start easier in cold weather. If you need more options at reasonable prices to consider, here are some models that we think maybe what you’re looking for. 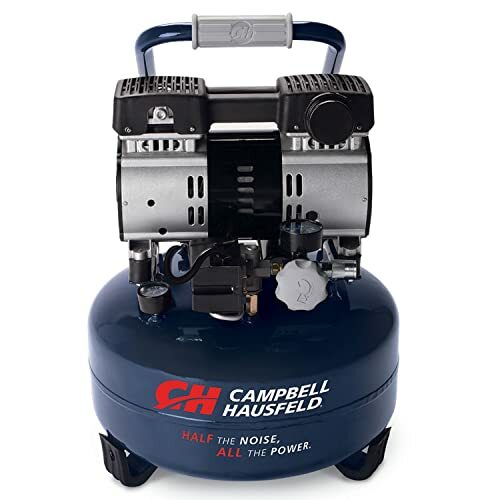 This Campbell Hausfeld DC060500 – 6 Gallon Pancake air compressor is designed to be one of the quietest pancake air compressors in the industry. It has a 1 HP, 7 amp induction motor that delivers 2.4 SCFM of air at 90 PSI (and 3.5 at 40 PSI), with a maximum PSI of 125, which is fine with tools like finish nailers, pinners, light-duty staplers, air spray guns, and other low air consumption tools. While you could use it with a framing nailer the tank would likely be constantly recycling. It takes a full 75 seconds to initially fill the tank, but then only 35 seconds for recycling. The DEWALT DWFP55130 Heavy Duty 200 PSI Quiet Trim Compressor is designed to run up to 3 finish nailers at once. At 3.0 CFM at 90 PSI, the pump recharges the tank at a 15% faster rate than most traditional pancake compressors. The tank operates at 200 max PSI and this higher pressure provides a greater amount of stored air allowing more work to be done. Additionally, the compressor begins recharging the tank when the tank pressure drops below 165 psi, providing a greater buffer and ensuring users won’t run out of the air. This compressor is relatively quiet, with a noise level of only 71.5 dBA, it’s quieter than most others in its class. The lower noise allows you to comfortably operate the compressor indoors while still being able to have a conversation with others. At only 36 pounds, it is easy to carry to and from the work site comfortably. Overall, this Dewalt is one of the best air compressors for nail guns currently available. With an affordable price, it’s the best deal right now. 3/8 in. crown stapler drives heavy-duty 3/8 in. crown staples from 1/4 in. to 9/16 in. and also 18-Gauge brad nails from 1/2 in. to 5/8 in. This Porter-Cable combo kit is one of the best compressor combo kits to buy right now. The price is great and far better than you could get if you purchase each item separately. This combo kit is ideal for framing and finish work, crafts, flooring, and furniture. 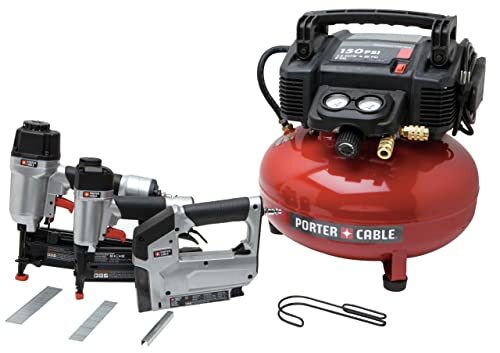 It includes a 6-gallon electric air compressor, 16-gauge and 18-gauge nailers, stapler, hose, and nails. The compressor features an oil-free pump to eliminate the need for maintenance and provides 2.6 CFM at 90 PSI which enables quick compressor recovery time. It has two regulated, factory-installed air couplers to easily support two users. We think this compressor combo kit is a great purchase and recommend it for any professional or homeowner. You can use it for most of your work – everything from installing trim to inflating air mattresses.